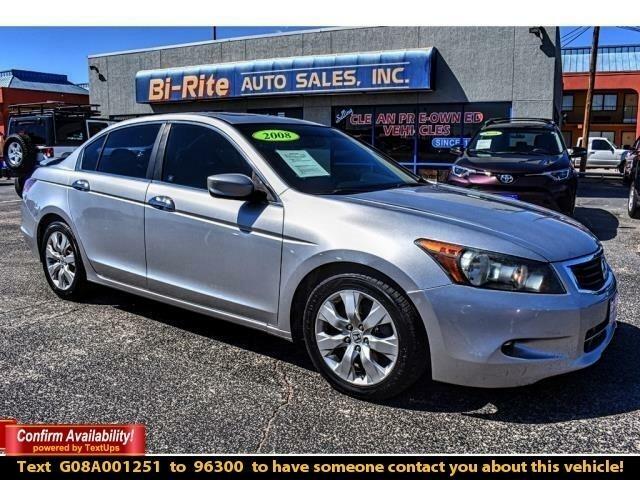 Our 2008 Silver Honda Accord EX-L V6 Sedan embodies the very balance that attracts so many buyers to the midsize sedan segment in the first place. Under the hood, you'll find the aggressive power of a top-end engine, a 3.5 Liter V6 that offers 256hp. Coupled with an efficient 5 Speed Automatic, this Front Wheel Drive has made it a clear favorite among auto critics and consumers alike! Inside, you'll appreciate the leather seating with heated front seats, ample leg and headroom as well as the dual-zone automatic climate control, premium audio, a sunroof, and more! It's clear the Honda Accord remains one of the few family cars that competitors will measure themselves against and one that consumers will use to measure other family vehicles. You know what athletes say: It's not boasting when you can back it up, and the Accord does! Print this page and call us Now... We Know You Will Enjoy Your Test Drive Towards Ownership! Please call us for more information. Message: Thought you might be interested in this 2008 Honda Accord Sdn.